Gul is an Orc miner that lives in the Orc stronghold of Mor Khazgur. 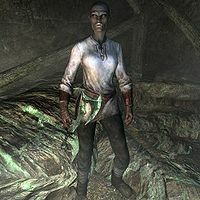 She works in Mor Khazgur Mine, an orichalcum mine located in the stronghold, with Ghamorz and Olur. She never sleeps, but instead uses her pickaxe on the many orichalcum ore veins in the mine, at times sitting down on one of the available chairs for a bite to eat. She wears a set of miner's clothes with gloves and boots. She carries a pickaxe, a leveled war axe (up to Orcish quality at level six), and a selection of common items and gold. She also carries the key to Larak's Longhouse, although she never gets to use it. Gul's work package has no time limits meaning her other package allowing sleep and other activities can never run. This issue has been addressed by version 2.0.4 of the Unofficial Skyrim Patch; it adds a 7am to 7pm timer to the work package.